In Greek Mythology, the Titans were the children of Gaia and Uranus—Mother Earth and Father Sky. Beings of incredible strength, they ruled the universe during the Golden Age. If that’s what you’re looking for in a propeller drive fishing kayak, you might just find a seat on Mount Olympus (or wherever the Titans lived) with Native Watercraft’s Titan Propel 13.5. FishingTech can happily give the Native Watercraft Titan Propel 13.5 an A rating. When you’re talking about Native Watersports pedal drive kayaks, most people come for the pedal drive and stay for the pedal drive. The company is “the first with reverse,” and many pros agree that they have the best system around. Dissenters would point to Hobie’s Mirage Drive, which was the first pedal drive system available. It’s also significantly different and comes with its own advantages and disadvantages. The Native Pedal drive allows you to switch directions by simply spinning the pedals in reverse. This allows you to actively fight some of the friskier lunkers you hook and keep your position so you don’t get blown or dragged into the overhanging pricklies or the weeds. The setup on the Titan, like all other Native propel kayaks, is wicked sturdy. The system is completely enclosed with anodized aluminum, which eliminates the material’s ability to react with other metals in a conductive environment (like underwater). Because it is completely enclosed, it should keep required maintenance to an absolute minimum. The prop is engineered in such a way that, upon collision with the odd rock or deadhead, it should protect the actual propeller and minimize the damage. Pro fisher Lou Martinez of Beyond the Bounds, in review of the Native Slayer, says he has really put the pedal drive through the ringer. The only maintenance he’s done over the years is pour in some chain lubricant from time to time. Reviewer Keep It Bent! has spoken about how he needed to buy a Native Watercraft repair kit, which ran him the equivalent of more than a couple cases of beer, to service his drive. That is no longer the case. You can completely dis- and re-assemble the propel drive using a large and small spanner wrench, an Allen wrench set, and some needle-nose pliers. Check here for a how-to on pedal drive maintenance. The Native Watercraft Titan Propel 13.5 also features a bow to stern rails system. That might sound like some fancy exaggeration, but it’s really not. The bungies that cover the front bow hatch are fixed on rails. Behind them come open rails on either side. Likewise behind the captain’s chair, and the bungies covering the open stern compartment, work the same way as they do over the front hatch. There might be a couple inches of the boat in which there’s a gap in the rails, but all said in done, you’re looking at about 26 feet of track on which you can place all the accessories you want and/or need. These rails are intended to be universal. Unlike Hobie’s rails, most accessories can be mounted easily onto these tracks. At the very stern sit two power pole mounting plates if you want to be able to hook up one of the best and quietest anchors available (in shallow water only). The rod storage for the Titan is downright ample. There’s a hull-molded staging rod holder immediately to the right of the captain’s chair which also might double as a cup holder. Along the rear compartment, there are also horizontal rod holders. With that horizontal rod holder, there’s also a small tunnel along the bow storage hatch that will protect the rod’s tip. And finally, at a boxy 13.5 feet in length, this kayak has plenty of room for cargo. The bow hatch is about two feet+ in length and held down by track-mounted sliding bungies. This is a good spot for ice, your lunch, your catch, the bootleg moonshine you’re smuggling, etc. Beneath the seat, there’s a storage tray which is as good a place as any for your tackle and your good luck charms. Behind, there’s a massive open storage area in which you could transport a sick baby elephant seal. Seriously, it’s massive. What’s kind of strange about this back area is the bungies don’t crisscross over it from the gunwales. Instead, they sit at the bottom. We’re not sure how useful this is, but hey, we’re not complaining. There’s also a sealable circular hatch at the bottom through which you can access the hull. The captain’s chair is hand sewn, exceedingly comfortable, and highly adjustable so you can pedal about with ease. It sits on rails and locks down with screw nobs. You can slide it pretty darn far forward and backward based on your femur length/preference. As the dude from VentureTube demonstrates, it also can recline all the way back for nap time. Let’s kick it off with the specs. The Native Watercraft Titan Propel 13.5 has a BIG profile. As advertised, it’s 13’6” in length and 41” (over 1 meter!) in width. The hull weighs just over 150 lbs. unloaded and unrigged. With all the gear, you’re looking at more like 180 lbs. It has a total weight capacity of 550 lbs. It also sits the lowest of all Native Watercraft in the water. The prop extends 14” below the beam of the drive. Depending on how loaded up the boat is, it might be even lower compared to the surface of the water. One of the most attractive features of this kayak is its stability. It is downright one of the most stable vessels you can buy. The fella from VentureTube opens his review with a shot of a full grown man standing directly on the edge of the Titan to demonstrate its incredible non-tippiness. 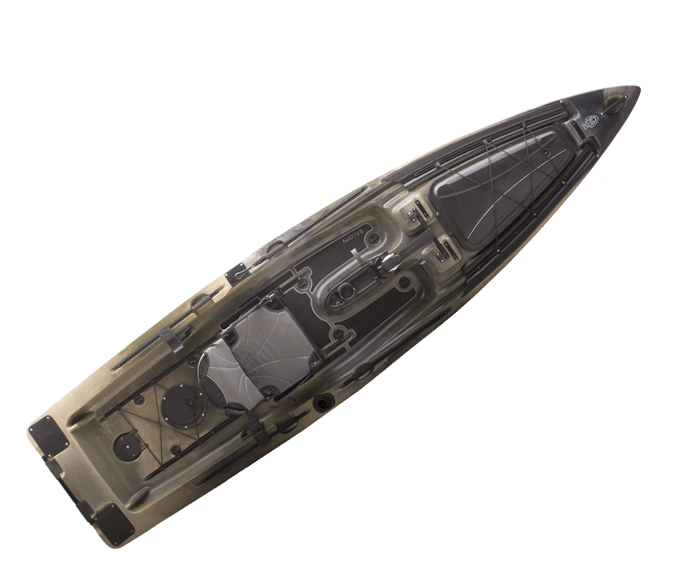 While most kayak manufacturers generate stability with a large hull capacity and perhaps some strategic shaping of the hull’s profile, Native goes a step further with the Titan. There’s a solid brick of foam inside the hull that extends the full length of the boat. Along with the concave shape of the underside of the boat, you could dance the tango on this thing. One thing that comes along with most stable boats is that you won’t be able to really get going in terms of speed. It has a pretty blocky shape and won’t win any sprints. That might be an issue if a storm’s coming in and you’re tucking tail for shore, but most of the time, you’ll be using the kayak to silently stalk your prey. In a general sense, this kayak also provides a pretty ideal ensemble for any kind of fisherperson. We hesitate to say it, but there’s almost no way 98% of the general population wouldn’t feel comfortable in this kayak. If you are a very small person, the boat might be bigger and have more floatation than you need, but that’s not exactly a problem or an issue. This boat does not come without flaws, of course. One common complaint with the Native Watercraft is you’re going to want to be careful going in to water shallower than two feet or so. Luckily, it’s fairly simple to raise the prop and bust out the paddle. New with the most recent Titan is a small lever on the prop that points the propeller flush with the column so it won’t catch coming through the hull. If the Titan—and any Native Watercraft for that matter—has an Achilles’ heel, it’s the rudder. The rudder is neither mounted off the top of the stern nor can it retract fully into the hull like with Hobie kayaks. Instead, it only raises to be flush with the keel, but still exposed. If you have to do any dragging, you’re probably going to scrape it up or even break it. That said, Native has made significant improvements with the rudder in newer models. As the VentureTuber demonstrates, you can really turn on a dime. It’s hard to beat this propeller drive. It offers hands free forward and reverse, it’s sturdy, and built to last. The tracks are long, and can hold most mounts. It’s very easy to add/attach other gear too, like power pole anchors, paddles, tiki torches, etc. This kayak is crazy stable. It has a huge weight capacity. You would be hard pressed to fill the storage up to capacity. The captain’s chair is adjustable, hand-made, and even nap-able. The rudder turns on a dime. The rudder system is exposed and has been reviewed as fragile. If you’re not sure if the Native Watercraft Titan 13.5 is worth the dough, consider Native’s primary pedal fishing kayak, the Slayer Propel 13. It has the same propel drive, and comes somewhat close in other categories, like stability, and fisher-friendliness. It’s also eight inches thinner, can carry 50 lbs. less, but the prop sticks down one inch less. It has similar rudder issues as well, but significantly less storage space. The real kicker is that, in terms of cost, you’ll save the amount of some beater used cars (even some that could pass inspection) in going with the Slayer compared to the Titan. Native has also released a Titan Propel 12 and Titan Propel 10.5 as a testament to what the company has started with the 13.5. When it comes to something more in the same market caliber, the Hobie Pro Angler is the obvious match up. Going up head to head, the Hobie definitely wins in certain categories. For one, it’s lighter (145 lbs. ), but has a greater weight capacity (600 lbs.). It’s also less blocky and tracks better through the water. But it’s also less wide and less stable. It doesn’t have the same amount of storage. The rails only accept Hobie accessories. And the Mirage Drive is fundamentally different. That final topic could be the subject of an entire article, and it generally comes down to personal preference. See our Hobie Mirage Pro Angler 14 Review. All things considered, the Native Watercraft Titan Propel 13.5 is a nearly flawless pedal drive kayak. The only real issue lies in the rudder system as noted in this review. There are many anglers who might not take full advantage of all that is offered with the Titan, and in that case, they could understandably settle for a cheaper kayak. But if you’ve got the capital and are in the market for a kayak with features ver t’s difficult to find a better kayak that money can buy.